Climb the spiral staircase up to the top Patio for 360 degree views of the backdrop of Table Mountain as you sip on a sundowner while relaxing on a recliner. The Roof Top Patio has loungers, tables and chairs and unbelievable views of the surrounding mountains. 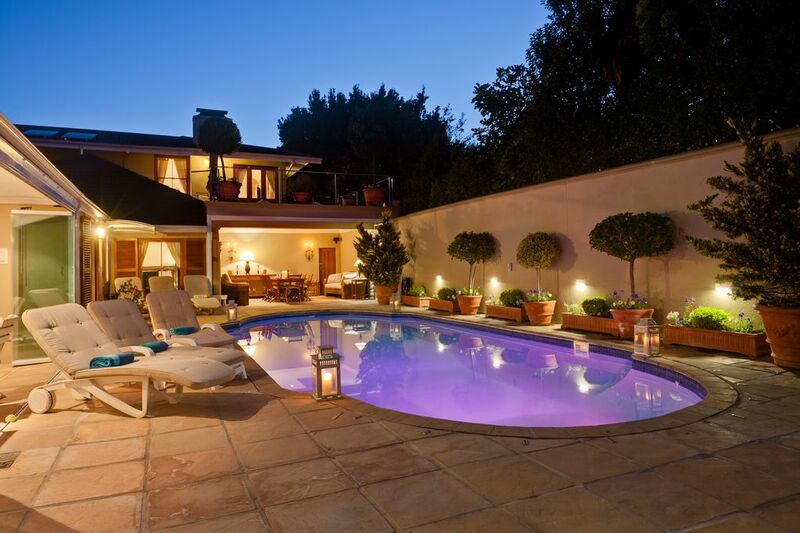 Lime Cottage also has access to the Heated Pool and Jacuzzi. Well trained & reliable staff we operate as a team offering our Guests personal attention & guidance on things to do guiding them with weather & other information. Think we are doing something right as we strive to improve & maintain our spacious gem in Upper Constantia that can host from large families without having a sense of feeling on top of one another in our well designed 6 Bedroom Villa. What you see is what you get when you view our photos of the Villa & surrounding area in fact most of our guests say that LeBonheur itself far outstrips the Beautiful Pictures. See you at Lebonheur soon. It is spacious, well designed & spread out to cater for large or smaller groups for Summer & Winter Holidays. Ideally positioned 1/2 and hour drive to the Airport & most of the popular tourist spots in & around Cape Town including The Victoria and Alfred Waterfront, Table Mountain and most of the popular beaches including Boulders Penguin Beach in Simonstown on your way to Cape Point. 5 Minutes drive to Constantia Village for your daily convenience shopping as well as top restaurants & several world renowned Wine Estates in the Constantia Valley. Popular restaurants to the foodies, Bistro 1682 and Buitenverwachting to name a few and not to be missed & for the keen golf enthusiasts, Clovelly, Westlake and Steenberg Golf Courses. Central, safe and secure. Large Solar Heated Pool & Solar heated Jacuzzi, 3 Covered Patios with Modern State of the Art Stacking doors that give you the feeling of being outside with a manicured Garden with spectacular Views of the backdrop of Table Mountain from our Rooftop Sundowner patio with amazing walks & Bike trails on our door step, along a greenbelt. Comfortable beds & a Team that will take care of your every need while on Vacation in Cape Town. New Lime Cottage boasts 5 Star accommodation, breathtaking,spacious 2 Double Bedrooms 2 Bathrooms both on suite with main bedroom having its own Dressingroom. Latest Decor & furniture with Large Tvs in all rooms DSTV 24 Hr Wi-Fi Open plan French style Kitchen with Gas Hob & full facilities (Washing machine,Dishwasher, Tumble Drier Double door fridge ) Main bedroom has King Sixe extra length Bed & 2nd bedroom Queen size extra length both with Memory foam pillow tops. 30 square meter Patio with Table & chairs, recliners & chairs overlooking lush Green lawn with Barbeque. WOW! What an amazing end to our Honeymoon! The cottage was just as described, we did not rent a car and solely relied on Uber. It was very easy to get around, we even did a wine tour using Uber. There is a mall and grocery store near by. This is a very safe neighborhood. The pictures do not do the cottage justice, it’s gorgeous and we did not want to leave! Athol is a wonderful host and lives on the premises, very responsive and overall a great guy! The pool and hot tub are beautiful. We had lunch at Beau Constantia, highly recommended! The views are amazing! We stayed in the Lime Cottage. We are from California and can not wait to come back! Thank you for the great 5 Star review. It is a beautiful 146 Square Meter Cottage with 2 Double Bedrooms 2 Bathrooms both on Suite with a Modern French Style Open Plan Kitchen onto Dining room & Lounge with a55 ins TV with Wi_fi & all the channels you can wish forOnto 30 Sq meter Covered Patio with State of the Art Glass stacking doors with 6 Seater Table & Chairs 2 Comfortable Chairs plus to Recliners with choice of a Barrel or Weber Barbeque overlooking a Manicured garden ( grass area) with use of Solar Heated Pool & Solar Heated Jacuzzi with spectacular views of the backdrop of Table Mountain centrally situated in the Heart of the Constantia Valley close to the Airport The Waterfront Table Mountain & Boulders Penguin Beach on your way to Cape Point & also close to most of the Popular Beaches around Cape Town. Toop Golf Courses 12 Top Wine Estates & Restaurants in the Constantia Valley & 2.5 Km from Constantia Shopping centre for all your daily needs & also Kirstenbosch Botanical garden also at your doorstep. Ideal for Summer & Winter Rentals with a Wood Burning Fire Place for perfect evenings as well as virtually off the Grid with our own Solar Electric Panels & Solar geysers & our own Purified Borehole Mountain Water. Perfect for families of 4 or one or two couples. We have a lot of repeat business which says we are doing something right looking after our Special guests join us a t Lime Cottage for a holiday of a Lifetime that you will remember for Many Years. We had a lovely stay at LeBonheur, in the Lavender Apartment. The Apartment has everything you need and stunning views of the moutains. The gardens are beautiful and we felt safe and so comfortable. Athol is a superb host who was attentive to our needs and who gave good advice as to the area and what to see and do. Constantia is a beautiful area with walking and cycle trails in the forest in close proximity. We also found it well placed to reach the southern suburbs and to explore Hout Bay and surrounds. Well appointed cottage in an excellent location. Hosts were most welcoming and helpful in assisting us to enjoy a truly memorable holiday. Four stars and not five only because our impression before arriving was of a cottage with views over a lawn whereas the lawn was modest and the view was of the adjacent cottage not the mountains. Apart from this everything was as described, amenities were great, the owner was super friendly and would be very happy to return and recommend to others. We appreciate your feedback. We have a roof sun terrace which we encourage our guests to enjoy should they wish to sip on sun-downers while taking in the mountain views of the Constantia berg, the backdrop of Table Mountain, also perfect to breath in the fresh morining air with a cup of tea at Sunrise. It was lovely to host you, and possibly next time you visit we could put you in our other cottage which is located upstairs and has it's own private terrace with a similarly breathtaking view of the mountains. We loved this spot in the heart of Constantia - central, impeccably maintained, luxury with friendly staff and owner who all went the extra mile to make us feel at home (complete with the occasional visit from Stretch the dog, who my kids adored). The accommodation has all you can think of - it's aestehtically well done, has great green tech (water & electricity), and has great wheel chair accessibility. Well done to Le Bonheur for nailing it! Thank you for your valued review! It was a pleasure hosting you over the Winter Season. Our aim is to give our guests a cosy, comfortable and memorable stay. Lime Cottage is bright,sunny North-facing 146 square metres, well appointed with all the mod-cons available at your fingertips, Comfortable beds, spacious French-style open plan kitchen, ideal for family meal times and relaxation, as well as covered patio with stacking doors which lends itself to year round entertaining. The courtyard garden was the perfect space for your daughters to play. Security is our priority. Lime Cottage is a short 5 minute drive to Constantia Village for your shopping necessities and a mere 20 minutes drive into Cape Town City Bowl or Cape Town International Airport as well as popular beaches like Muizenberg, Houtbay and Camps Bay. We are close to Bel-Ombre Meadow, one of the many greenbelts in Constantia, well known for long walks and mountain biking. In a nutshell - family fun at its best. Lovely place - very accommodating and comfortable! Our accomodations were more than we expected. Comfortable beds and a very nice living area and kitchen. We also had an outdoor sitting area with a great view. Athol was very gracious and when we had a problem with the electiricity, it was addressed immediately and fixed properly. The location was perfect for our family as it was a 5 minute drive from our son's house, and the house was in a beautiful area. Thank you for the positive review we strive to Improve Lime cottage all the time & if any guest makes a good positive suggestion during their Holiday we act immediately & rectify or improve.We recently replaced with Nice New soft towels & have put 100% Blockout in the bedrooms to give our Guests a good nights sleep on the amasingly comfortable beds. We have also had our Strong Borehole water tested & added into the Cottage with proper Filters & U V lights so we are completely free & self sufficient with Water in our Large Solar Heated pool & have also installed 36 Solar Electric panels so we are virtually off the Grid with Battery back up so are always staying ahead of the game offering our New Guests 5 Star treatment & welcoming our returning guests which we have built up a big repeat booking with our special Guests who have become part of the LeBonheur family.Please it is important to book your dates as soon as you have confirmation to secure your favourite Guest House. Our Staff appreciate your positive feedback after years of reliable & hard work.We look forward to welcoming you back to Lime Cottage at LeBonheur Many Thanks LeBonheur Management. Die plek is pragtig en rustig. Tuine is mooi en geriewe uitstekend. Dankie vir 'n baie lekker tydjie by LeBhonheur. Dis binne bereik van al die besienswaardighede en tog rustig sonder geraas. Ons is gasvry ontvang en Athol Childs was baie behulpsaam met wat ons benodig het. Dis 'n klein juweeltjie in Constantia! Thank you for a great review for Lime cottage our new 5 Star 146 Square meter spacious Cottage with 2 Double Bedrooms 2 bathrooms both on suite with a a large French Style Open plan Kitchen fully equipped with a Dining room & Lounge with Large TV DSTV & wi-fi overlooking a 30 square meter covered patio with State of the art Glass stacking doors that can be easily opened or closed depending on the weather making it a perfect choice for winter or summer included in the lounge is a Closed wood burning Fire Place. On you patio a six seater Table & Chairs as well as 2 Comfortable chairs with 2 Recliners with a choice of a barrel or Weber braai on a 80 square meter grassed lawn with secure parking & use of Solar Heated pool .We all strive to offer our guests the best service with weather reports popular Tourist places to visit in & around Cape Town and now we have another satisfied customer friendly guests who I am sure will return again to Lime Cottage at LeBonheur as do many of our Guests return annually or every few years becoming part of the Lebonheur Family. Protected from the summer winds, making it an ideal venue for both summer and winter vacations and within easy travelling distance to many of the well-known sight-seeing spots found in the 'Mother City'. Le Bonheur is ideal for Film shoots, Company Conferences, Guests attending weddings or just for the family or a couple looking to get away from the hustle and bustle of everyday life to experience a holiday of a lifetime. Central to the six top Wine Farms in Constantia Valley. Groot Constantia and Buitenverwachting and UItsig to name a few. Golf Courses, Westlake, Steenberg & Clovelly. A short drive to the city bowl and Victoria & Alfred Waterfront.